We were in Trader Joe’s recently and picked up some whole wheat lavash. It’s a bit thicker than a tortilla and far thinner than the traditional pizza crust Americans are used to piling toppings upon. If you’re in a hurry, or want a lighter style pizza, this is the way to go. Lightly spray eggplant with olive oil and toss to coat. Spread upon a baking sheet and place in the oven. Cut the top off the entire head of garlic and drizzle with olive oil. Wrap in foil and place in the oven. Bake the eggplant and garlic for 45 minutes, tossing the eggplant halfway through. While the eggplant and garlic are in the oven, sauté the onion in a bit of olive oil until softened. Add the zucchini and sauté until the edges are caramelized. Transfer to a bowl. Place the pan back on the stove and, once heated, add another drizzle of olive oil and add the kale. Toss until coated then add a cup of water and the dried apricots. Turn down to a simmer and cook until the greens have wilted and the apricots are rehydrated. Drain, if necessary, and set aside. To make the cheese: Add tofu, cashews, sundried tomatoes, garlic, lemon juice and oregano to a food processor. Pulse until incorporated. Season with salt and pepper. Once the eggplant and garlic have roasted, remove and add the eggplant to the sautéed onions and zucchini. 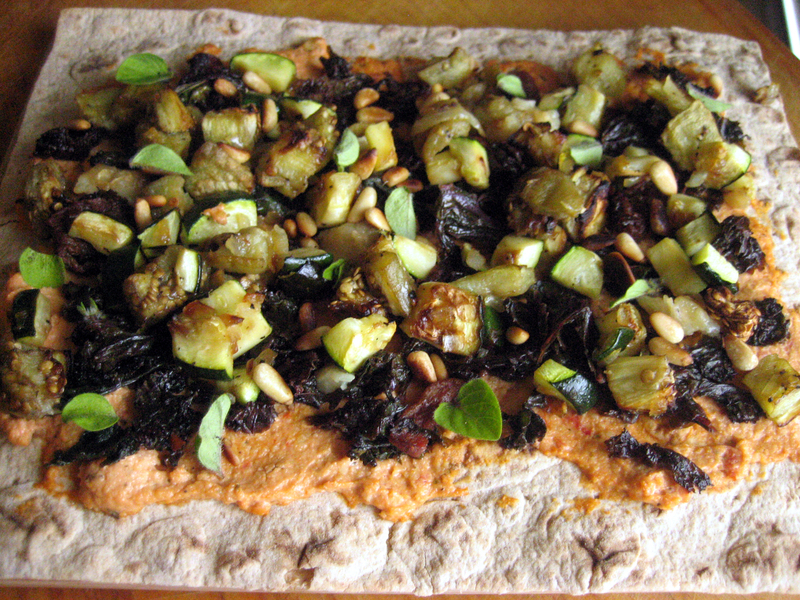 Place a lavash bread upon a baking sheet and pop into the oven for 4-5 minutes to crisp up a bit. [You do not want the lavash to get gooey when you add the toppings.] Spread the cheese onto the lavash using a spatula. Top with the cooked vegetables and cloves of roasted garlic. Bake for a few minutes until warmed. Garnish with the toasted pine nuts and fresh oregano. Alright, trying this one tonight 🙂 Looks like you guys had a fun weekend! Pigs Peace Sanctuary is a wonderful place. We will most definitely be returning on a regular basis to lend a hand and recharge our own batteries. I think you’ll like this pizza a lot. The cashew cheese is so tasty you won’t miss traditional cheese one bit; you might even dig it more! D—sooo yummy even Terrence loved it (although he did have to add a little pepperoni :)) When you’re ready to be a personal chef we have a spare bedroom! I really enjoyed the sun-dried tomato and cashew cheese. We used only basil, tomato, and zucchini on top, and it was very light and delicious. A good tip with lavash is to spray the top and bottom with cooking spray and to bake it on a pizza stone so the middle doesn’t get mushy.